(parallels.com/toolbox). Through Parallels Desktop 14, customers now have access to more Windows features on Mac than ever before. Typically, virtual machines are large, taking anywhere from 15–100 GBs of space or more. With two different storage mechanisms at work (Windows and Mac), newly engineered storage optimisation that takes both Windows and Mac mechanisms into account can result in significant disk space savings. * The new Free Up Disk Space dialog that suggests storage-saving actions now better handles multiple virtual machines. Newly created snapshots occupy up to 15 percent less disk space. Preconfigured Touch Bar sets for the following applications have been added to Parallels Desktop 14: Microsoft Visio and OneNote, SketchUp, AutoCAD, Revit, Quicken, QuickBooks and Visual Studio. They join current Parallels Desktop Touch Bar sets for Windows applications, including: Office 2016 (Microsoft Word, Excel, PowerPoint, and Outlook), Windows Start Menu and desktop (Cortana, Task View and Task Bar pinned elements), File Explorer (File Open and Save As settings), ArcGIS and web browsers (Internet Explorer, Microsoft Edge, Google Chrome, Mozilla Firefox, Opera and Vivaldi). The Parallels Desktop Touch Bar Wizard makes it easy for users to customise the Touch Bar for thousands of Windows applications, so their function key shortcuts are at their fingertips when using the applications. Additionally, with the use of Touch Bar XML Authoring, users can further personalise the Touch Bar with their own customised function key shortcuts for their favorite Windows applications. Parallels Desktop 14 supports Dark Mode. Quick Look issued on Windows files now shows quick actions. Support for additional Mojave features, which are currently in development, will be tested, finalised and introduced around the forthcoming public release of Mojave. The Parallels Desktop 14 for Mac installation image, which is notarised by Apple®, will be seen by users when it is installed on Mojave. Parallels Desktop 14 now features improved OpenGL support for enhanced graphics, with notable improvements in SketchUp 2017/2018, CTVox, DIALux 8 and OriginLab. New Business Edition features include enhanced management, plus security and licensing portals. Smart card readers are now automatically available in both Mac and Windows for faster access (if enabled). Replace existing virtual machines in Deployment Mode to streamline productivity. Applications deployed in the Single Application mode start faster, along with a new modernlooking splash screen. Free Memory – Reclaim RAM memory and optimise its consumption on your Mac.Add this Free Memory tool to the macOS menu bar to easily check how much RAM is available with just a click and reclaim available memory. Resize Images – Batch convert images to your desired file size and format. Simply drag the source images to the tool’s window, specify the desired dimensions/size and output location, and click. The CPU usage indicator has been added to the title bar to give a better understanding of high CPU usage in Windows. Resource Monitor is completely redesigned to show Mac resources along with the impact that multiple virtual machines have on them. Mac Business Edition are available for subscribers and upgraders from Parallels Desktop 12 and 13 (parallels.com/upgradepd14), as well as new customers, online at parallels.com/desktop and at local retail and online stores worldwide. Free 14-day full-featured trials are also available for download. The recommended retail price (RRP) of Parallels Desktop 14 for Mac is US$79.99 for an annual subscription or US$99.99 for a perpetual license. Parallels Desktop for Mac Pro Edition and Business Edition are each available to new customers for US$99.99 per year. 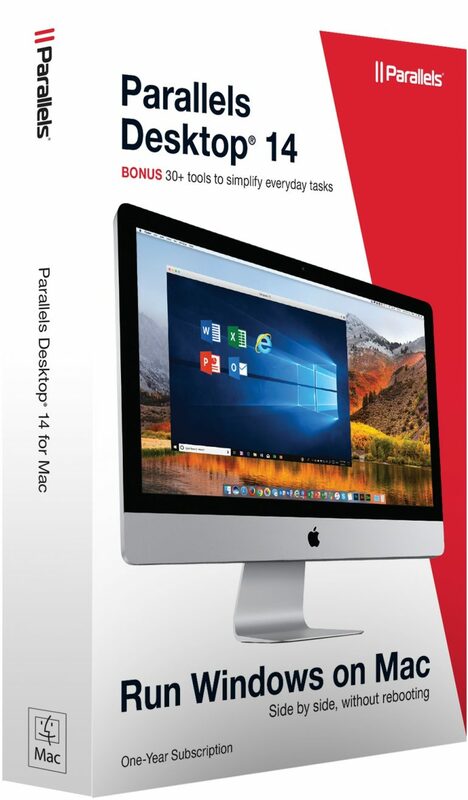 Parallels Desktop 12 and 13 perpetual license customers can upgrade to Parallels Desktop 14 for US$49.99, or upgrade to a Parallels Desktop for Mac Pro Edition subscription for US$49.99 per year. Parallels Desktop subscriptions include a complimentary concurrent subscription to Parallels Toolbox for Mac or Windows (parallels.com/toolbox), as well as Parallels Access® (parallels.com/access).